I’ve got the perfect cold treat for you that’s super easy to make on a hot summer day (no oven required!). I saw a similar recipe in a magazine and loved how easy it looked, thinking about how it would be good for when we occasionally break our rules and enjoy a sugary homemade treat. The only problem though was that the recipe called for WAY too much sugar in my opinion – an entire cup of powdered sugar. Eeek. That would be so sweet I would barely be able to taste the flavors of the other yummy ingredients. So I pared down the sugar quite a bit and tweaked the other ingredients until it was to our liking. 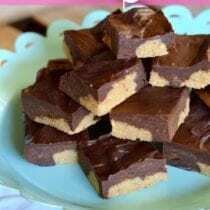 I hope you enjoy these No-Bake Peanut Butter Dessert Bars just as much as we do. This one is definitely a keeper! Line a 9" X 5" loaf pan with wax or parchment paper and set aside. In a small bowl, stir together the peanut butter, sugar, cream cheese, and warm melted butter until well combined. Drop it by the spoonful (in chunks) onto the bottom of the prepared pan. In a small pot, melt together the chocolate and cream on low heat. Stir until smooth, then pour on top of the peanut butter chunks and spread into one even layer. Cover and freeze for 1 to 2 hours or until the chocolate is set. Store the leftovers in the fridge. These look so yummy! I’m definitely going to give these a try! Thank you for sharing! These will be gone within 30 seconds of me taking them out of the freezer. Thanks so much for posting! I know – that’s the problem with these! What are the dimensions of the loaf pan you used? I’m thinking that chocolate chips melt and spread okay…could I just melt the chips without using any cream? I never have cream. The cream keeps the chocolate from being too hard to cut into bars or bite through when it sets. You could sub 2 tablespoons butter or peanut butter for the cream. Thank you. I have both of those. A little peanut butter in the chocolate sounds like it’d be tasty in this recipe. 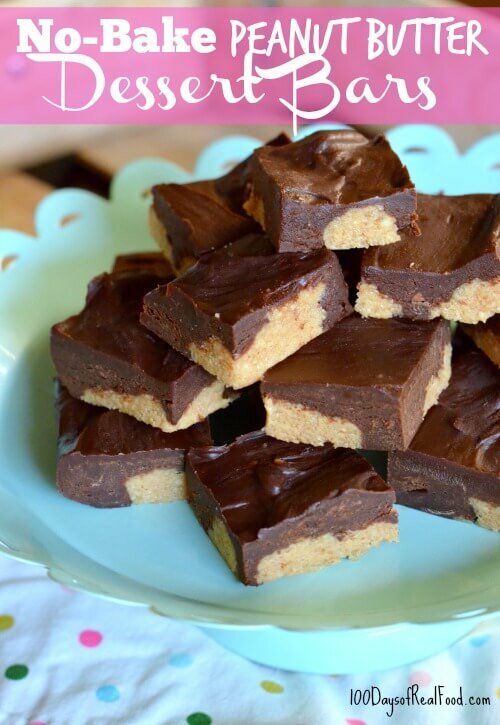 Do you think that these would be good with just the peanut butter layer only? I know crazy…..but my DH can’t have chocolate or citrus. So making desserts for him is tough. Thanks! They do look lovely just like this though but he would be sad to not get some. I wonder the same thing. I do not like the taste of powdered sugar. It tastes artificial some how. I just made these and subbed maple syrup instead of powdered sugar. Tasted great! I’m sure honey would work as well. Made these yesterday and they are AMAZING! I can’t even imagine putting a whole cup of powdered sugar in here, they were perfect! I’d love to make this recipe but am wondering what brand of cream cheese you use and where you find it? I can only find brands like Philadelphia or my grocery stores generic brand, both of which are full of unrecognizable ingredients. Organic Valley makes good cream cheese, if you can get it. It’s available at normal grocery stores (like Woodman’s) where I live in the Chicago suburbs. Can I sub something for the cream cheese? I can’t stand the taste of if. Hi Christy. We’ve not tried substitutions in this recipe. You won’t taste it, it’s covered in peanut butter and sugar. Loved these but my thoughts are, if we’re trying to eliminate fake sugar, these definitely don’t need as much as 6 tablespoons. I’m going to try for 4 next time I make these because they were very good and a great treat when you don’t want to fire up your oven on a hot day. Maybe just a bit too sweet– which is saying a lot for me. Great recipe though! Would like to make these for my son who lives out of state. Do you think I could ship them or do they need to stay refrigerated? Hi Dolly. There is a lot of dairy in this recipe. I would keep it refrigerated. I’m wondering about using chunky peanut butter for this recipe. Do you think it will work? I never have creamy peanut butter in the house. Hi Jen. I think chunky should work just fine. I just made this tonight and it was delicious! It’s a great sweet treat without going way overboard. A small square is plenty to satisfy you! I love this. Thank you for sharing. Thanks for a yummy no bake recipe. I used 4 TBSP organic powdered sugar, and subbed 2% milk for the cream since I didn’t have any on hand. I put them in mini muffin tins with paper liners and they were the perfect size. Use your leftovers for something else. It’s delish on oatmeal. Or I have this amazing potato recipe. Spray a baking dish, pile I sliced peeled potatoes, add cream almost to cover, sprinkle with salt, pepper and if have any parmesan cheese. Bake uncovered in a 450 for about 25-40 mins. I made these using full fat coconut milk (the kind in a can) instead of heavy cream and they turned out great! I never use heavy cream because I don’t really like the taste of it. You can use coconut milk in the can. Make sure it says full fat on it. Hi Roy. We’ve not tried a sub in this recipe. I would stick with a dry ingredient. Delicious! The peanut butter layer still stayed fairly soft for me so it doesn’t hold its shape very long after being cut but still tastes great! Do you mean a loaf pan or a square pan like the kind you use for brownies? Hi. Lisa used a 9×5 loaf pan. A loaf pan is used for bread. What brand of peanut butter did you use ? Hi Kendell. We look for an organic peanut butter without added ingredients. Just peanuts and maybe a little salt. Hi Linda, thank you for the recipe. I was wondering which peanut butter you use? I really like to avoid the bad fats. I make peanut butter balls at every Christmas and use a smooth style. It is a treat, so I save the recipe for the holidays and wrap them in little candy papers and freeze them. thanks! so sorry I wrote Linda not Lisa. Hi. We look for an organic peanut butter without added ingredients. Just peanuts and maybe a little salt. My daughter has a severe peanut allergy. Do you think sunbutter would work as a substitute? Yes, we’ve not tried but I think it should work fine. Very yummy and easy to make. I even thought it was a little too sweet, considering the chocolate chips also have sugar in them. I’m going to try it next time with only 3 tablespoons of powdered sugar instead of 6. Also, I used coconut oil instead of butter and it worked and tasted great! I made these and substituted full fat coconut milk for the heavy cream. So delicious! Hi there. That is not information that we provide. This post helps put that into perspective: https://www.100daysofrealfood.com/2013/01/04/healthy-eating-defined/. Can you tell me if this recipe works with natural peanut butter (the kind that has to be stirred)? Or does it need to made with something like Skippy? Hi. We use an organic natural peanut butter.